The Pension Benefit Guarantee Corporation (PBGC), an entity created to “guarantee” pensions of private corporations, is on the verge of bankruptcy. Teamsters and other unions are poised to take huge pension hits. Previously, airline employees have taken a hit. Please consider PBGC Running Out of Cash to Cover Union Pension Funds. The clock is ticking for 71 penniless union pension funds that rely on a federal insurance company to support their retirees — because the agency itself is also running out of cash, its director said Wednesday. The Pension Benefit Guaranty Corporation’s limited liquidity is part of the spiraling U.S. pension crisis that threatens to wipe out the retirement savings of more than a million Americans. The PBGC talked about its reduced circumstances Wednesday as it announced that it is now officially making pension payouts for Teamsters Local 707. 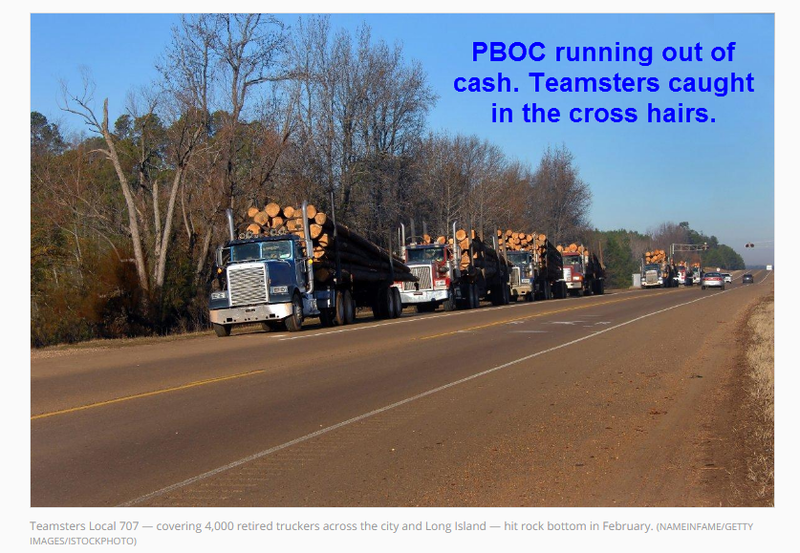 The New York union’s pension fund — covering 4,000 retired truckers across the city and Long Island — hit rock bottom in February. The PBGC stepped in, as it has with 70 other bankrupt union pensions. But PBGC only has about a decade’s worth of cash in its coffers, director Tom Reeder warned. Local 707 alone, with its 4,000 retirees, costs PBGC $1.7 million a month, agency officials said. In order to keep afloat, PBGC doesn’t try to match a retiree’s union pension. The payouts are cut, often down to about one-third of what the worker is due. [if the fund were to go broke] Retirees could expect to see their benefits slashed by 80%. In other words, less than one-eighth of the $570 average check PBGC is able to give Local 707 retirees now. Insolvency happens when you overpromise benefits that cannot possibly be paid. Pension promises bankrupted many companies because they could not keep up with competitors who could charge less because they did not have union pensions to deal with. In essence, unions brought this upon themselves by demanding benefits that could not be met. Public unions would be in the same boat except politicians keep raising taxes in a foolish attempt to stave off the inevitable. In many cases, it’s not as much foolish as it is corrupt. Politicians in bed with unions often have their own pensions to protect, at taxpayer expense. The PBGC is a US government agency but it does not rely on taxpayer funds, at least not yet. PBGC receives no funds from general tax revenues. Operations are financed by insurance premiums set by Congress and paid by sponsors of defined benefit plans, investment income, assets from pension plans trusteed by PBGC, and recoveries from the companies formerly responsible for the plans. The Pension Benefit Guaranty Corporation (PBGC) protects the retirement incomes of more than 40 million American workers in nearly 24,000 private-sector defined benefit pension plans. A defined benefit plan provides a specified monthly benefit at retirement, often based on a combination of salary and years of service. PBGC was created by the Employee Retirement Income Security Act of 1974 to encourage the continuation and maintenance of private-sector defined benefit pension plans, provide timely and uninterrupted payment of pension benefits, and keep pension insurance premiums at a minimum. PBGC is not funded by general tax revenues. PBGC collects insurance premiums from employers that sponsor insured pension plans, earns money from investments and receives funds from pension plans it takes over.